The Record DML305-VS is the variable-speed version of the DML305 lathe. It is driven by a 1/2 hp three-phase motor with an inverter system to convert the single-phase electrical supply to three-phase, giving the motor more torque than a single-phase motor. The electronic variable-speed system is made by Schneider of Germany and gives smooth control through a speed range of 400-3,950rpm. The speeds ranges are changed in three steps via a pulley system, accessed by opening the front of the headstock. The spindle thread is 20mm (3/4in) x 16tpi and incorporates a 1MT for the four-prong drive centre, as does the tailstock. The lathe gives a turning capacity of 305mm diameter over the bed with 393mm between centres; however, there is the option of extending the length of the lathe bed with the addition of a bed extension, which can also be purchased. On first impressions, I found the DML305-VS to be very sturdy and well made due to the lathe's cast-iron construction. The banjo and tailstock, also made of cast-iron, meant that both could be moved easily via single-handed operation. The cam locks and handles are also solid and give good positive locking, again, via single-handed operation. 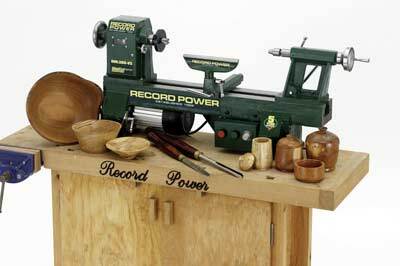 For this review, the lathe was fixed to a solid wooden bench. It was easy to assemble from the box and I encountered no problems. However, for an additional cost you can purchase a well constructed metal stand, which is a useful addition if you want to transport the lathe to different locations etc. Firstly, the drive centre was placed into the headstock and the tailcentre was brought up to allow the alignment to be gauged. I discovered that this was precise and in line. During the test I decided to firstly turn a 50 x 255mm (2 x 10in) spindle between centres. I first roughed down the blank with the lathe running at around 1,500rpm. I found the variable-speed control to be smooth and immediate, and for the size of the motor, gave good torque under what I would class as a heavy cut for the size of the lathe. I then changed to the highest speed range. To do this I needed to alter the drive belt configuration, which is accessed via a door at the front of the headstock. Firstly, a hex-head screw has to be undone in order to open the door - a safety feature to stop access to the moving parts while the lathe is running. The addition of a micro switch also cuts the power to the motor if the door is opened whilst in operation. A simple lever in front of the motor then alters the belt tension, and the belt is changed and locked in place by tightening the lever. I found this to be a bit of a chore, but realised this is a necessary and important safety feature. I used various tools to produce beads, coves, 'V' and other cuts, and found the lathe to perform well with no vibration. Next, I roughed out a 200mm (8in) bowl blank which I attached to the 75mm (3in) faceplate, which comes with the lathe. The speed control enabled me to fine tune the speed while the blank was out of balance. I balanced the blank using a 15mm (5/8in) bowl gouge and found the lathe to be smooth and solid. 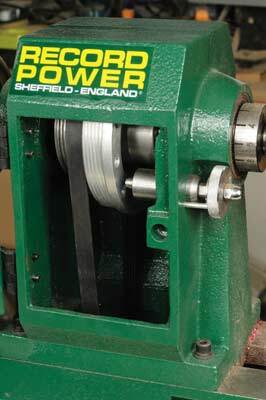 Using the variable-speed enabled the blank to be roughed as efficiently as possible, once balanced. With the addition of a chuck - which can be purchased separately - I turned the inside of the bowl; the lathe coped well with this. The chuck ran true and again, the variable-speed added the fine tuning and therefore made the process as efficient as possible. All in all I found this to be a very good lathe but I did find having to use a hex-head key to undo the belt change access doors a bit of a tribulation, but realise this is important for safety reasons. The variable-speed gave a very good range of speeds between belts, which negated the need to change belts frequently. After a bit of practice, I found belt changing to be easy and quick. 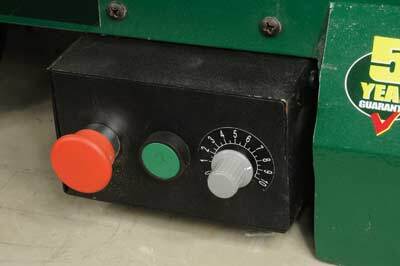 The positioning of the control panel on the front of the lathe bed was easy to access and the controls were positive. I am not easy to please, as I always buy the best tools I can lay my hands on, but I cannot fault this lathe; I liked everything about it. I consider it to be a lot of lathe for the money. I found this lathe to be solid, well made and finished. The variable speed is a very good addition to the DML305, which I currently own. From personal experience, I would advise spending extra on the variable speed version. It is compact and solid with a good capacity for its size. 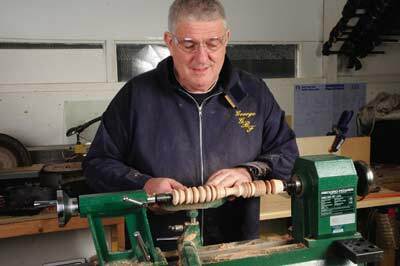 This lathe is ideal for those who have limited space or who want a lathe to move about for demonstration purposes etc. Also, at the current price, it is great value for money.